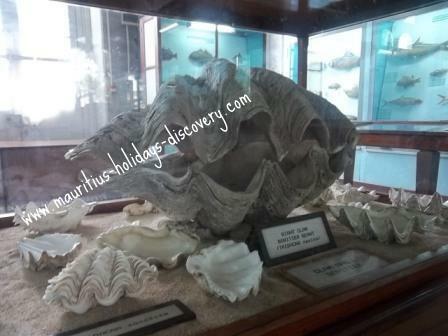 When you are around in the City of Port Louis, you cannot miss the Mauritius Natural History Museum. 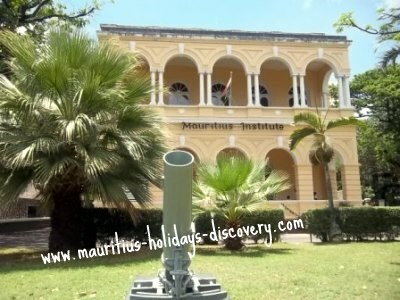 It is located on the ground floor of the Mauritius Institute which was established by Governor Sir George Ferguson Bowen and built around 1880. The building is a partial replica of Sri Lanka’s Colombo Museum building. 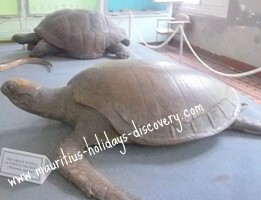 The Mauritius Natural History Museum exhibits, amongst other displays, the collection of two naturalists – Julien Desjardins and Louis Bouton. The collection was formerly exposed in the Desjardins Museum which opened its door in 1842 and was later transferred to the Mauritius Institute in 1885. 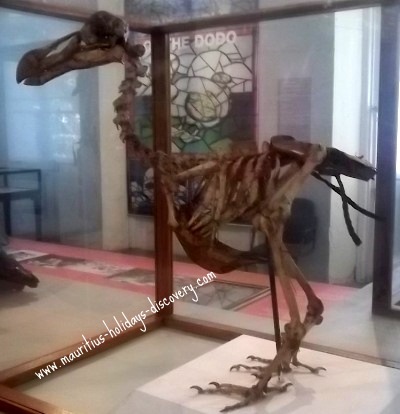 The oldest museum of Mauritius is divided into four galleries: - Fauna Gallery, Marine Life Gallery, Insects, Meteorology, Giant Tortoise Gallery and The World of the Dodo. On your very first step inside the newly setup Fauna Gallery, you’ll be taken back for a short educational trip to the Jurassic Period, around 150-148 million years ago. The cast fossil of an Archaeopteryx, donated by the British Museum, is displayed. Archaeopteryx, referred to as Urvogel (“first bird”) in German, shared a number of features common to both birds and dinosaurs of that time and is considered a link between them. They had small teeth as well as long bony tail. It is believed that it is the first bird of its kind to change from land dweller to a bird. The only specimens of Archaeopteryx that have been discovered come from the Solnhofen limestone in Bavaria in southern Germany. Next to the “dinosaur bird” you’ll see some bones of the giant elephant bird of Madagascar, the Aepyornis. The egg of this bird was big enough to hold the contents of some 180 chicken eggs. Its weight was estimated to be over 400 kilograms. Coming back to the present time, stuffed specimens of birds from different parts of the world, marsh birds and migrating birds are beautifully displayed alongside species introduced, whether accidentally or by man, in the island. The Indian Myna (local name: Martin – introduced from India), the Common Waxbill (local name: Bengali – introduced from South Africa), the House Sparrow (local name: Moineau – introduced from India) are some of the various bird species you’ll find everywhere around Mauritius. The Spice finch (local name: Pingo) is more discrete; you wont find many whereas the yellow-frinted Canary (Local name: Serein du pays – introduced from Tropical Africa) is a bird species which flits around chiefly in the Filoas trees on the gorgeous beaches of Mauritius. Our island is surrounded by sea and it is a real pleasure to admire sea birds around. 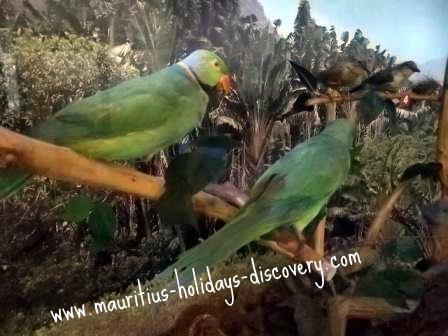 The specimens displayed, the Red-tailed Tropicbird, the Trinidad Petrel and the White-tailed Tropicbird are birds which majestically soar over Round Island, Ilot Gabriel, Coin de Mire and Flat Island - the offshore islets off the northern tip of Mauritius at Cap Malheureux. Out of the 25 species of endemic land birds unique to Mauritius only 9 have survived the activities of man and the destruction of their fragile natural habitat by exotic mammals. All species are classified endangered! You’ll find birds of the exhibited species mostly in the protected nature reserves of Macchabée, Bel Ombre Nature Reserve, Black River Gorges Natural Park and at Bassin Blanc. At the Marine Life gallery of the Mauritius Natural History Museum you’ll find a diversity of fish species which populate the sea around Mauritius and the Indian Ocean. Many are displayed in glass cases while some hang from the ceiling. The collection is rather old and you can immediately feel their lackluster due to prolonged exposure. Alongside specimens of commercial fish, those of poisonous ones are also exposed. Fish poisoning in Mauritius was reported as far as 1601 when the Dutch sailors became ill from eating fish. They were cured by swallowing a mixture of oil and vinegar. A giant clam, the skull of a sperm whale washed up off Ile de la Passe and found in October 1986 and the skull of a beaked whale will definitely attract your attention. This section offers rather scant but nonetheless interesting materials about the formation of rocks, water cycles, fossils and minerals as well as the formation of cyclones. The formation and distribution of various corals – hexacorals, octocorals (gorgonians or sea fans) and madrepores are well illustrated side by side with local and exotic butterflies and insects found in Mauritius. In the Plant World area you’ll discover endemic plants and reptiles of Mauritius. The Trochetia Boutoniana (French: Boucle d’Oreille, literal English translation: earring tree) is the National Flower of Mauritius since 12th March 1992 – the day our country achieved the status of Republic. The Bois d’ébène was a hardwood much sought after by the Dutch when they colonised the island . Cuttings of other endemic hardwood with quite funny names such as Bois Makak, Bois de clous, Manahé, Bois cerf and Bois Tatamaka are also exposed. Giants tortoises exposed on a platform are mostly sea turtles and those species introduced in Mauritius – like the giant Aldabra Turtles (brought in from Madagascar and Seychelles). They should not be confused with the extinct endemic giant tortoises named the Mauritius saddle-backed giant tortoise (cylindraspis inepta) and Mauritius domed giant tortoise (cylindraspis triserrata). These species were heavily exploited by the Dutch in the 17th century for their meat and rich oils. Predators such as rats and pigs also contributed to their extinction by preying on their eggs and young ones. Some of the bones and skulls of the extinct tortoises which were discovered at Mare Aux Songes are displayed both at the Mauritius Natural History Museum and the National History Museum of Mauritius. The dodo is symbolic to Mauritius as much as the panda is to China or the kangaroo to Australia. But the dodo is now extinct! Our island was once the home of this flightless bird (scientific name: Raphus cucullatus). It was first encountered in the late 1500s or early 1600s when the Dutch came to Mauritius. They called it walghvogel (nauseous bird) due to the fact that although stewed for a long time only the breast was tasty. By the mid-1600s the bird, a member of the pigeon family, was already extinct due to intensive hunting and the destruction of their ground nests by rats and pigs. In 2005 a Dutch-Mauritian research team excavated remains of the dodo at Mare Aux Songes, a fresh water lake formed as a result of sea level rises 4000 years ago. Mare aux Songes is a mass grave. The Dutch-Mauritian research team found more than 8000 bones of the dodo, extinct tortoises, fossil plant material, snail shells and insect remains. This discovery led to many interrogations. It is still a mystery how this mass grave was formed and why so many different species of animals and dead plants became concentrated in this small area, forming a half meter thick concentration of fossils. Radioactive carbon dating of bones provided clues that the animals died within a couple of centuries, but scientists cannot explain why. Did they die because of a disaster or did they gradually accumulate over time? Ongoing geological and paleontological research by the Dodo Research Programme aims to shed light on the Mare aux Songes Mystery.